Given how affable Matt Damon is, it’s hard to believe that anyone’s ever born him any ill will. Despite all the “diss” tracks, his feud with Jimmy Kimmel is just a joke (yes, really). Even Minnie Driver, who was unceremoniously dumped by her Good Will Hunting co-star when he pulled a reverse Tom Cruise during an Oprah interview, has merely described herself as “saddened” by the circumstances of their breakup. But back in the late ’90s, hot off his first Oscar nominations, Damon was rubbing comedian Colin Quinn the wrong way. In a February 1998 installment of Saturday Night Live, Quinn ran through the news about Mary Kay Letourneau as well as the execution of Karla Faye Tucker to get to his “op-ed” on the hidden evil of Damon. Quinn did grudgingly concede that Damon might be a talented guy. But the Weekend Update anchor thought it far more likely that Ben Affleck was doing the heavy intellectual lifting for the Good Will Hunting script while Damon did bicep curls. Sure, it’s hard to believe that, given their current social standings, anyone ever thought Damon was the douchebag in that duo. But that’s the story Quinn stuck with in this bit, working himself into a lather until he invoked Godwin’s Law and just flat out compared Damon to Hitler. 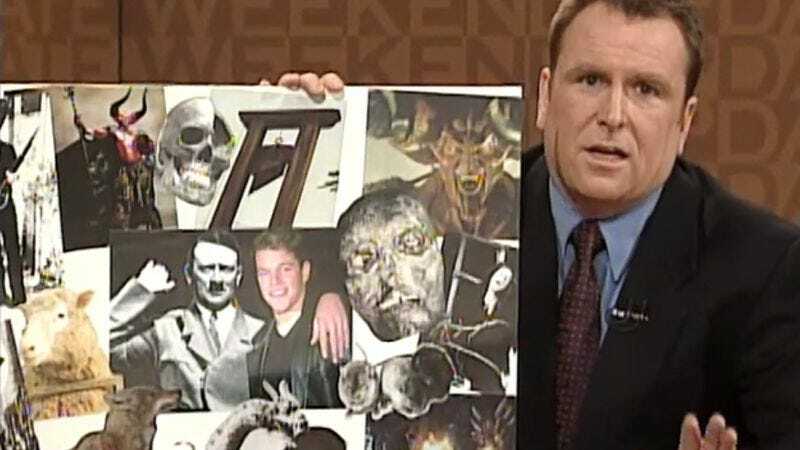 He even made a collage with photos of Damon, the Führer, and various incarnations of the devil (including one of our favorite cinematic ones) to illustrate the “atrocities” the actor might have committed. There’s an image of a guillotine, because Damon could very well have been a time traveler, as well as a picture of what we assume is Dolly the cloned sheep. We assume Quinn’s Irish Catholic roots and his hatred of Damon led him to draw some kind of parallels between Nazi eugenics and cloning. But if that’s the case, then Quinn must have really bought into Damon’s genius act in his Oscar-winning film, so you’d think he’d give the actor a little more credit. Quinn didn’t repeat his theory in any later Weekend Updates, but it’s possible that he was just trying to establish a recurring bit like Norm Macdonald’s “Germans love David Hasselhoff” belief. He was, after all, Macdonald’s successor, though he only anchored the segment for two years. After Damon took home a Best Original Screenplay Oscar the very next month, Quinn probably realized the premise would never gain any traction. But that doesn’t mean there isn’t some Dogma-inspired diorama in Quinn’s garage.